Sometimes when you want a nice plate of spaghetti, a pasta salad plate makes so much sense! 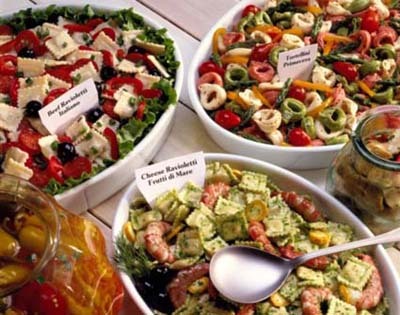 We have all seen those pasta salads in company buffets and elsewhere, they are always welcomed by guests... when done right with a good recipe! Also on hot summer evenings when the last thing you need is more heat, there are very elaborate cold pasta recipes that can fit nutritionally as a meal's main course. For lunch, too, when a complicated meal isn't in the cards this can be a convenient way to use the pasta leftovers; there are many instances when pasta served chilled is very welcomed. In the next few weeks we will be expanding to this spaghetti sauce recipes section with more delicious recipes that are served chilled. We will explore here all the interesting classic cold pasta recipes or simply the pasta salad recipes that we can find and try. Come back every once in a while to see what the new tasty spaghetti recipes we have found and added, for your convenience! To go back to the spaghetti sauce main reference, click that link!